January 20 was a cold windy day in an upstate winter. I was on my way for a visit and photo shoot in Burlington Vermont. It was a day long journey that included travel by train, taxi, ferry, automobile. The Vietnamese Roman Catholic community in Burlington would soon celebrated Tet, the lunar New Year with a Mass and a party. I was, on my way to visit with friends in that community and to photograph both Mass and Tet Party for them. The journey starts with a long train trip from City Rochester to much smaller Plattsburgh – both in upstate New York, US. A train switch in Schenectady sees me on the Amtrak “Adirondack”. Older cars on older tracks made for a slow and rocky ride. That said, we arrive at historic Plattsburgh Station spot on. A taxi is located – this took some doing, with the ride shared with a State University of New York student returning to campus (however, no reduction in fee). The Ferry Depot sat a couple of miles outside of town. Once on the Ferry it is but a short ride across the still open waters from the shore to Grande Island – the Vermont terminus. A relatively short but necessary walk uphill in bitter cold and stiff breeze seems very long indeed. Thankfully my friend/ host provided a car and driver to meet me – his car and he drove. The car ride went from Grande Island to Burlington. The trip: an immediate drive over a causeway to the mainland and then a drop down to my friend’s place in Essex Junction and my destination for the day. The hot air blasts from the car’s heater and I thaw as we traveled the Causeway. I glanced back and before my eyes, far left to far right, stretched the most lovely sunset. The sun, as commanded by earth’s movement, dips below the Adirondack Mountains and shadows them. 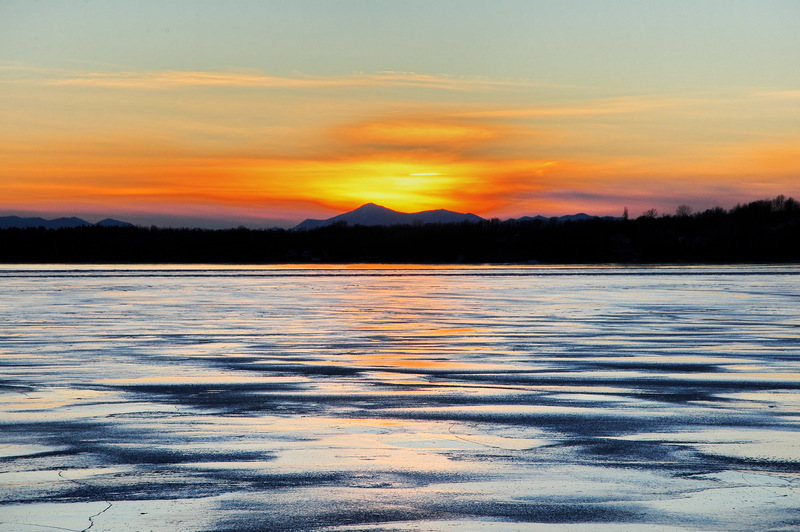 A rainbow of fiery colors beams across sky and reflects off the frozen waters of Lake Champlain. I’m speechless as the beauty engulfed me. Well almost speechless. “Stop,” I manage to yell. My friend does stop but in an proper way. I snapped off several as I shudder in the biting and very cold winds crossing the frozen Lake. Back in the car I smile and bask in the glow of this perfect ending to a long strenuous day of travel. Perhaps there is even a moral to this story. Be aware of where you are both ahead and behind. Sometimes, it pays dividends.